Douglas Johnston was born in Indian Territory in 1856. 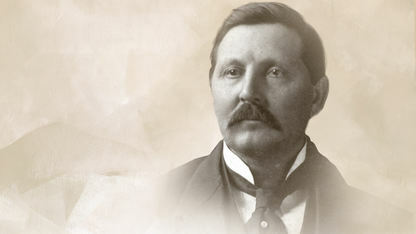 He was the very first governor to be appointed by the president of the United States in 1906. He served as governor of the Chickasaw Nation for over 30 years, until his death in 1939. Johnston worked tirelessly for the Chickasaw Nation, making ratifications to the Atoka agreement and constantly working to maintain tribal control of Chickasaw schools. The ratification to the Atoka agreement allowed Chickasaws and Choctaws to review tribal citizenship cases that had been accepted by the Dawes Commission. Johnston’s administration had several legal victories that helped the Chickasaw Nation regain prosperity. Because of the changes to the Atoka agreement, the courts revoked nearly 4,000 fraudulent claims of citizenship, and saved the Chickasaw and Choctaw tribes approximately $20 million. In 1924, Johnston and the Chickasaw tribe garnered permission to sue the federal government in the U.S. Court of Claims to reacquire funds the government illegally obtained from tribal resources.